Everybody loves shrimp. Put shrimp out at a party and see a Pavlovian reaction from your guests as they swarm en masse to the sweet pink crustaceans. Private Benjamin Buford “Bubba” Blue summed up our feelings about shrimp when he poetically called it the fruit of the sea and listed hundreds of ways to prepare them. Unlike chicken where the sauce enhances the meat, shrimp is the star in any preparation. Shrimp’s versatility extends beyond flavor combinations. 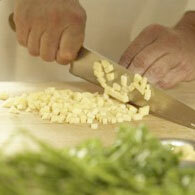 It can also be prepared with a multitude of cooking methods. Whether Grilling, sautéing, deep frying and even boiling, the shrimp’s character, texture and flavor is maintained. I am often asked what the difference between shrimp and prawns is. From a culinary viewpoint the only real difference is what part of the world your kitchen is located. Europeans and Australians prefer prawn and American’s find more comfort in the term shrimp. In aquaculture shrimp refers to the marine variety and prawn to the freshwater type. Ask a biologist and another definition is forthcoming. Since I am an American chef and my loyal readers are looking for recipes, I will stick to the term shrimp and get to how to cook them rather than discuss what we should call them. There are several varieties of shrimp you may find at your local fishmonger. Brown, white and tiger are the most common. Stay away from tiger shrimp as they are easily overcooked and can be rubbery. White shrimp are my personal favorites for color, taste, and texture. Shrimp are best purchased shell-on. Shrimp are sold by the pound and sizes are classified by count per pound. The smaller the number per pound the larger the shrimp are. After peeling the shrimp, save the shells for use in making stock. Shells can be wrapped and frozen until you accumulate enough for a decent size batch of stock. After peeling, shrimp need to be deveined. Make a small slit and remove the intestinal tract. Don’t slice too deep unless you are stuffing or frying the shrimp. Shrimp are found in waters all around the world and feature prominently in many global cuisines. My favorite culinary match is shrimp and garlic whether in scampi or roasted in an aioli for fried or grilled shrimp. Shrimp also prove my culinary doctrine that all foods are enhanced by bacon. The contrast between the sweet pink meat of shrimp and the smoky, salty, fatty strips of bacon meld into a flavor explosion in your mouth. These simple to prepare morsels can be served as an appetizer or entrée. Roasted garlic or horseradish sauces complete the flavor explosion. That is the joy of creating shrimp dishes, they can stand on their own and they can stand up to robust and spicy preparations as well. Curried or Kung pao, gumbo, jambalaya or étouffée – there is a shrimp dish to satisfy every palate. Whether you call them shrimp or prawns, this month’s recipes for Bacon-Wrapped Shrimp with Horseradish Aioli, Garlicky Cajun Bar-B-Que Shrimp and Shrimp in Tarragon Tomato Cream Sauce will tantalize your taste buds, Until next month, Bon Appétit. In cast iron skillet, melt butter. Bring to simmer. Cook 5 minutes. Serve with dirty rice and corn on the cob. Persnickety Tip: Can also be baked in 400 degree oven for 12-15 minutes. Wrap each shrimp in ½ slice bacon. In food processor, blend yolks, salt, lemon juice, parsley, horseradish and scallions until smooth. Drizzle in oil slowly until emulsion is formed. Chill 2 hours. Serve with shrimp. Heat oil in large sauté pan over high heat. Brown shrimp on both sides in batches. Reserve on side, in same pan. Add shallots and deglaze with wine. Reduce by half. Add tomatoes. Simmer 3 minutes. Add cream. Reduce until sauce coats back of spoon. Add tarragon and juice and zest of lemon. Add shrimp back into sauce. Cook 3-4 more minutes. Serve with rice or pasta.